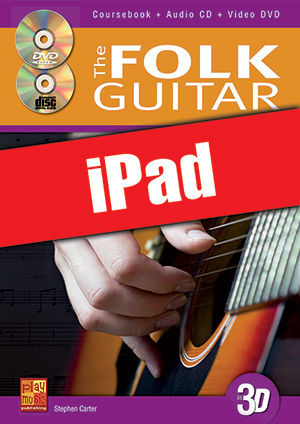 The Folk Guitar in 3D (iPad) (GUITAR, Courses for iPad, Stephen Carter). This coursebook is intended for all those who want to discover the many-faceted expressive possibilities of the folk guitar or, more generally, of the acoustic guitar. Arpeggio and chord accompaniments give you the opportunity to go into the fingerpicking and flatpicking technique. The capotasto (short ‘capo‘), an indispensable accessory of the folk guitar, occupies a whole chapter in this coursebook; the same holds for the alternate tuning. The coursebook obviously also addresses articulation techniques (such as slides, hammer-ons, pull-offs or ghost notes), as well as complementary percussion techniques. All this is skillfully packed into a multitude of ‘acoustic licks‘, inspired by the world’s greatest artists – Bob Dylan, The Who, Tracy Chapman, Cat Stevens, The Eagles, Simon and Garfunkel, Oasis, Extreme or The Beatles. The DVD shows you how to properly play the numerous accompaniments presented in this coursebook; the CD, on the other hand, provides you the opportunity to practice the accompaniments over adequate backing tracks. Since you are dealing here with the iPad version of the tutorial, the book, the CD and the DVD have been replaced by a tablet-optimized multimedia pack containing musical sheets, texts, audios and videos.